MTD01-0357.19 THANK YOU! Thanks also go out to our speakers, meeting hosts, meeting sponsors, including Bolton & Co., Continental Tire, Freedom Tire Distributing, Giti Tire, Independent Tire Dealers Group, KYB Americas Corporation, Michelin Commercial Truck, O'Reilly Auto Parts, SEMA Wheel & Tire Council (WTC), Streamline Dynamics, Tiremetrix, Tire Industry Association (TIA), and annual sponsors Cintas Corporation as well as Flyers Energy. 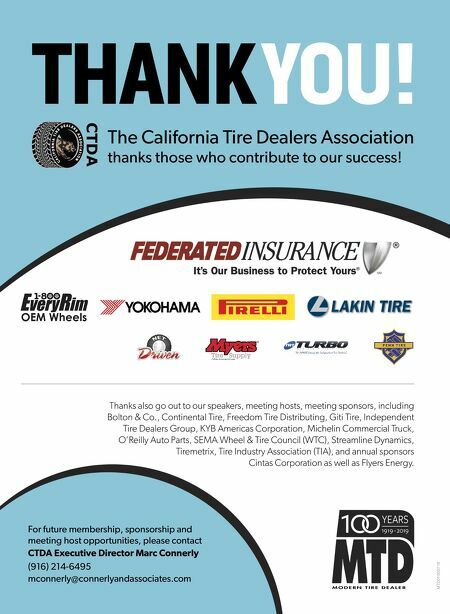 For future membership, sponsorship and meeting host opportunities, please contact CTDA Executive Director Marc Connerly (916) 214-6495 mconnerly@connerlyandassociates.com The California Tire Dealers Association thanks those who contribute to our success!